Because it readily conducts heat and electricity, graphene also may be a good biosensor. But it's not neutral. 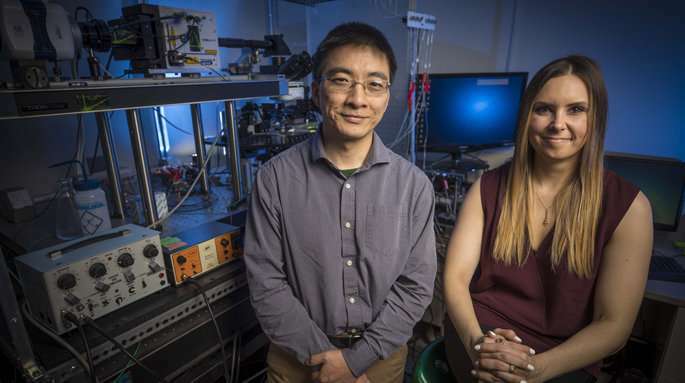 When Vanderbilt University scientists tried to use graphene to measure electrical activity in the brain, they found that it actually enhanced nerve cell signaling. These findings, reported last week in the journal Nature Communications, came as a complete surprise to the investigators. They raise the possibility that graphene may enable researchers to change how cells communicate with each other by manipulating the cholesterol content in the cell membrane. Graphene "not only may be a very good vehicle to deliver drugs but also a way to potentiate the drug effect," said the paper's senior author, Qi Zhang, Ph.D., assistant professor of Pharmacology in the Vanderbilt University School of Medicine. The researchers began their experiment by growing neurons—nerve cells—on a sheet of graphene. The paper's first author, Kristina Kitko, a graduate student in interdisciplinary material science, picks up the story from there in an invited column she wrote for a Nature Chemistry blog: "We observed an increase in neuronal firing frequency on graphene," she wrote. "This was substantial and our curiosity was piqued. When we began to look at more targeted measurements of presynaptic activity, what consistently emerged was surprising: synaptic potentiation on graphene." Realizing that graphene was likely acting at the nerve cell membrane, which consists primarily of cholesterol, the next question was: "Might cholesterol somehow be involved?" "This led us to the idea of manipulating membrane cholesterol levels," Kitko continued. "Cholesterol plays important and fundamental roles to cells in a variety of ways, but with particular relevance to drug discovery we demonstrated the effect of graphene on G protein-coupled receptors, whose activity are mediated by cholesterol." Half of all drugs target these receptors. Kitko has been invited to present her group's findings at a Gordon Research Conference on "neuroelectronic interfaces" next month in Galveston, Texas. "Graphene "not only may be a very good vehicle to deliver drugs but also a way to potentiate the drug effect,""
- So they're saying they can introduce graphene into the brain and improve connectivity? Is this potentially as monumental as i think it is? Imagine dependable concentration, total recall, and 300 IQ. Imagine seamless interface with peripherals, AI, the internet. Distributed computing using our brains. Perhaps this means the singularity need not happen without us. Imagine a movie with Tom cruise. Didn't I already see this? Lucy? Graphene is also carcinogenic and it slices cellular membranes like scalpel. But according to the article, its not. Lithium is poisonous but it has kept you going for a long time yes? How do you explain these things zypper? So please - get in touch with the authors and tell them they are going to be killing people. Ever see the tv show Homeland? Carrie has developed a tolerance to her lithium and we aren't sure if she is right about the president being a schizo murderer or if she's just manic again. You're full of mysteries as well. Soot happens to be a very random set of oxidized carbon products, often with other elements or metals included, much of soot is actually tiny bits of tar or stuff looking like tiny bits of charcoal. Yes, there is 'Some' graphene in soot, they have found curled bits and flakes that they have known to be highly eroding of equipment as well as hard on people's lungs in that it can slice cell walls easily. But soot is Not JUST graphene. Graphene is like a large, clean piece of paper compared to a pile of rotting garbage if one were to actually compare graphene to soot.